K-18 (Finnish for "a film not allowed for viewers under the age of 18") was originally formed in 2006 to perform and record my composition "Five Kubricks of Blood". When preparing for our very first public performance at TUMfest07 in Helsinki, Finland, this composition grew into a total of nine pieces inspired by the films of Stanley Kubrick, which were then included on our first recording, Some Kubricks of Blood (TUM CD 022). Just as Stanley Kubrick and his world were a natural choice as inspiration for our first excursion into the world of movies, David Lynch was equally obvious as our second choice. The films of David Lynch have inspired me since I was a teenager. His style is unique in that his films are like Russian matuschkas consisting of different layers. The mystical places, that he has created, bring up feelings that are hard to define with words. Music might well work better in that regard. Lynch somehow manages to pass the conscious part of your mind and enter into somewhere deeper. The feelings that I got from certain of his films continued to dwell on for years or even decades after first seeing them. I still remember very well most key segments of his films that I have seen although, in some cases, this happened more than 20 years ago. When preparing for this recording, I decided not to watch the films again so I was working with the images that I have carried with me for a long time as my own impressions and memories. Almost every composition on this recording is inspired by a certain character in Lynch´s films. The music is not a soundtrack but, rather, each piece is a reminiscence of the initial feeling that the character left in my mind. All of the compositions on Some Kubricks of Blood and also on this recording were written specifically with the members of K-18 in mind. The five years that have passed since our first recording and our live performances during the intervening period have only strengthened my conviction that the personalities and instrumentation presented by K-18 complement each other in a unique way. 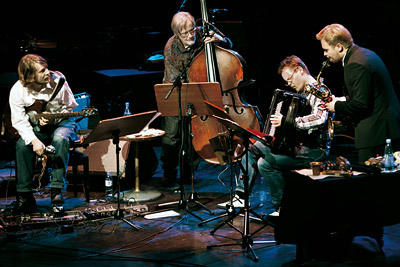 These include Veli Kujala´s background in both classical and improvised music and his one-of-a-kind instrument in this group, the quarter-tone accordion that allows for micro-intervals with the accordion that is usually only known as a well-tempered instrument; Mikko Innanen´s saxophones, which he plays both "straight" and in many more unorthodox ways; and the double bass of Teppo Hauta-Aho, which combines his unparalleled experience in improvised music, jazz and classical music over more than five decades. With K-18, I thought the possibilities offered by the electric guitar would work particularly well and decided to use one almost exclusively although I often also play the acoustic guitar with other groups. Musically, I wanted to combine elements of jazz improvisation with soundscapes coming more from modern classical music and avant-garde rock. Our goal as a group is to work on a collective sound and create something that is unique to us. The music has a lot of room for improvisation and the biggest challenge for us is to combine the composed and improvised material. 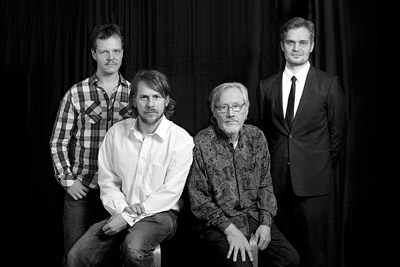 I am happy and proud to work with these great musicians, who make it seem so easy and natural. Our recording location was also oddly suitable for these reflections on the twisted world of David Lynch. Namely, the great sounding and well-equipped Studio P4, with walls and ceilings covered by expensive hand-crafted hardwood, is located in the outskirts of the old East Berlin in a studio originally built for the State Broadcasting Company (Rundfunk) of the German Democratic Republic, or Deutsche Demokratische Republik (DDR). The studio building (Funkhaus Berlin) in turn is in the center of a half-vacant, derelict campus of the old State Broadcasting Company that has in recent years become a beehive of artistic and other grassroots activities. In its current state of disrepair - an old symbol of totalitarian power having succumbed to, more or less, anarchistic forces of the future - it would be an ideal setting for another tale by Mr. Lynch. BOB, Laura Palmer, Agent Cooper and The Man From Another Place (inspired by the television series Twin Peaks, 1990-91, created by David Lynch and Mark Frost). In the television series Twin Peaks, a beautiful young girl named Laura Palmer (Sheryl Lee) is murdered. FBI Special Agent Dale Cooper (Kyle MacLachlan) is investigating the murder. Cooper has to work with real and surreal figures before the truth finally comes to light. A mystical giant called "The Man from Another Place" (Michael J. Anderson) tries to warn Cooper about further evil deeds. The murderer is an evil spirit called Killer BOB or just BOB (Frank Silva), who has possessed the body of Laura´s father, Leland Palmer (Ray Wise). "BOB" starts with a violent guitar leading into a microtonal jazz theme. The guitar and the saxophone are soloing on an uneven ground. "Laura Palmer" is a slow and ghostly waltz. The music floats into a double bass feature and then rises into a loud cry. "Agent Cooper" has a surreal but humoristic atmosphere with the saxophone and the double bass bumping into each other while the guitar and the quarter-tone accordion sing a microtonal blues. "The Man From Another Place" is a wall of screaming sound. The Elephant Man (inspired by the film The Elephant Man, 1980, based on a screenplay adopted by David Lynch, Christopher De Vare and Eric Bergren from books by Sir Frederick Treves and Ashley Montagy). The film The Elephant Man is based upon a true story of the life of Joseph Merrick (called John Merrick in the film and played by John Hurt), a severely deformed man who lived in London during the 19th century. The film illuminates the emotional burden and extremely sad destiny of someone totally different than his fellow men. "The Elephant Man" is a collective improvisation where the individual voices create a living and vulnerable whole. Mulholland Drive (inspired by the film Mulholland Drive, 2001, originally conceived as a television series by David Lynch). The film Mulholland Drive is an incredible psychedelic trip through Hollywood as you never would have imagined it. "Mulholland Drive" is an exception among these compositions in that it is not based upon a character but rather a dreamy street in Hollywood. The composition is a dense wall of sound, modulating slowly between different subconscious spaces. Eraserhead (inspired by the film Eraserhead, 1977, based on a screenplay by David Lynch). David Lynch´s first film, Eraserhead, is a story about a man, Henry Spencer (Jack Nance), whose child is a mutant monster. The life of his family in the industrial wastelands of America becomes a surreal nightmare. "Eraserhead" has a twisted African feel featuring the quarter-tone accordion and an African flute. Lula Pace Fortune and Sailor (inspired by the film Wild at Heart, 1990, based on the novel Wild at Heart: The Story of Sailor and Lula by Berry Gifford). Lula Pace Fortune (Laura Dern) and Sailor Ripley (Nicolas Cage) are lovers in the film Wild at Heart. Lula´s mother Marietta Fortune (Diane Ladd) hires a gangster to kill Sailor. Sailor manages to stay alive, but has to go to prison for many years. In the end, he comes back and sings "Love Me Tender" by Elvis to Lula. "Lula Pace Fortune" is a minimalistic picture growing into a massive soundscape. "Sailor" is an intimate improvisation featuring different duo settings. Alvin Straight (inspired by the film The Straight Story, 1999, based on a screenplay by Mary Sweeney and John E. Roach). Alvin Straight (Richard Farnsworth) is the hero of the film The Straight Story, which is based on a true story. Alvin was 73 years of age in the summer of 1994, when the original events took place. One day, Alvin is mowing his lawn when he suddenly decides to take a trip to visit his 80-year-old brother Lyle (Harry Dean Stanton), who had recently suffered a stroke but whom he has not seen for decades because of a fight they had. Not qualified for a driving license due to his impaired legs and vision, Alvin makes the 240-mile trip from Iowa to Wisconsin sitting on his 1966 John Deere riding lawn mower. At a speed of five miles per hour, the trip takes him six weeks, but he finally makes it and the brothers reconcile. "Alvin Straight" is a beautiful ballad featuring the double bass. The Mystery Man (inspired by the film Lost Highway, 1997, based on a screenplay by David Lynch). The Mystery Man (Robert Blake) is a devilish character in the film Lost Highway. My favorite scene is where the hero of the film, Fred Madison (Bill Pullman), a free jazz saxophonist, talks with the Mystery Man at a party. The Mystery Man makes Fred call home saying that he is also there at the very moment. The hero returns home and things start getting really dark. "The Mystery Man" deals with the feeling of one´s personality disintegrating. In the composition, each of the four voices is equal, like four sides of a split personality all talking at once. Frank Booth (inspired by the film Blue Velvet, 1986, based on a screenplay by David Lynch). Frank Booth (Dennis Hopper) is the crazy criminal from the film Blue Velvet. He cuts people to pieces and is extremely jealous of his lover, Dorothy Vallens (Isabella Rosselini). However, he also has a gentler side and likes to be treated like a baby suckling a breast. "Frank Booth" features the baritone saxophone as Frank´s alter ego. The composition has a dualistic character oscillating between two different extremes.